Like the best games of the 1980s, the 2014 reboot of the seminal Capcom classic Strider wastes no time getting right down to business. Within seconds of booting it up, you're hang gliding right into the heart of Kazakh City and slashing cyborgs with the quickness of a ninja. Within minutes, you're grappling with a giant robot dragon thousands of feet in the air. Countless enemies fall to your blade as neon sparks rain from every surface, and from its opening moments to the final white-knuckle encounter, Strider makes itself known as the raddest game to come along in years. First conceived as an arcade game in 1989, Strider is a Japanese anime brought to interactive life. You play as Hiryu, a member of the eponymous squad of super badass ninjas. His singular mission: to defeat Grandmaster Meio and his more-or-less Soviet-era super soldiers at all costs. Motives, character development, plot--all of these are thrown out the window, relegated to the instruction manual and various collectables strewn about Kazakh City. Strider has no time to concern itself with such ancillary things. Instead, Double Helix and Capcom wisely focus on what made the original so great: that is, putting you in the shoes of an unstoppable whirlwind of awesomeness. 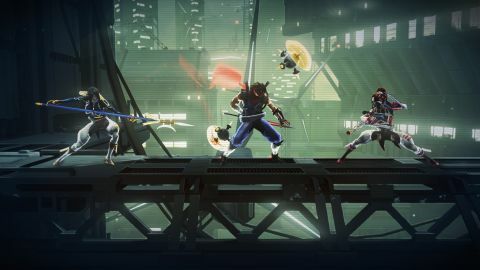 From Hiryu’s signature cartwheel jump, to the silvery crescent of his blade attacks, to the updated soundtrack and scanline-infused aesthetics, Strider is a love letter to the original arcade classic, amped up to eleven. Simply remaking the arcade game wouldn’t do, though, as the experience would be over in a handful of minutes. Instead, this reboot is an exploration-based action-platformer, similar to Super Metroid or Shadow Complex. You’ll explore the nooks and crannies of this not-really-but-clearly-Communist metropolis, finding new weapons, power-ups, and hidden items as you go. Sword upgrades, throwable kunai, and a neon-purple cyber-panther are among some of weaponry you’ll discover on your mission, and they’re all a blast to use. It takes your entire repertoire to tackle the Grandmaster’s minions, as some foes are susceptible to certain attacks while impervious to others, making combat a constant moment-to-moment array of twitch reactions. But these implements of destruction aren’t merely for slicing up fools--they also unlock gates that would otherwise block your progress. What starts as a fairly linear journey quickly opens up as you constantly find new weapons and abilities, and wandering off the beaten path will reward you with even more goodies to unlock--including extra modes to play outside of the main game. And while the in-game map can be confusing to read until you get used to it, it merely highlights the numerous layers and sections you’ll explore in Strider’s varied locales. Unlike the games that it emulates, Strider minimizes necessary backtracking unless you actually want to go back and scour through previously explored locations. The threadbare narrative along with Hiryu’s dogged pursuit of his mission provide a constant forward momentum, and his quest for justice will take you to secret laboratories, a massive flying warship, and derelict slums alike. Kazakh City is a neon-soaked dystopia; a hacky Russian accent booms across these slick yet sterile environs, their copious secrets beckoning you to disregard your mission and explore. Hiryu’s quest may send him off on a few wild goose chases as he hunts for the necessary items he needs to progress, but the four or so hours it takes to finish rarely feel like padding. Not since Bionic Commando: Rearmed has a reboot of a classic game made the leap to the current generation so well. Like the futuristic ninjas that share its namesake, Strider makes the daunting task of singlehandedly taking down a despotic tyrant effortlessly cool. And did I mention you get a cyber-panther? Description A reboot of the classic side-scrolling action game, this is a 2.5D digital download with shiny HD visuals and plenty of wall jumping and sword-slicing.